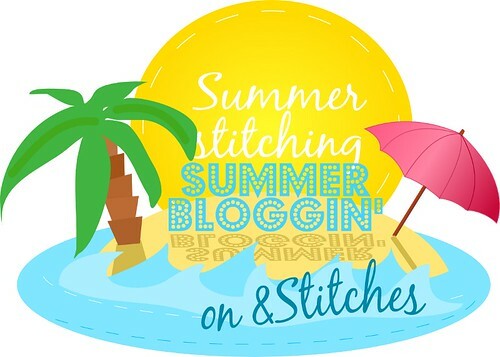 The last post of our Summer Bloggin' series is brought to you by Lauren from Molly and Mama. 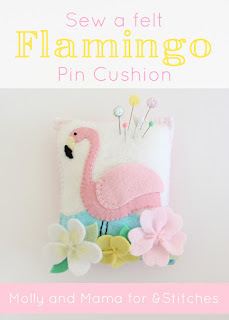 Lauren is an Australian based craft designer and she's sharing an adorable Flamingo Pin Cushion Tutorial today. Hi, I’m Lauren from Molly and Mama and I’m so excited to bring you this Felt Flamingo Pin Cushion tutorial. We’re finally heading into Spring here in Australia, so it’s nice to be inspired by sunny days, pretty flowers and some tropical fun! And what’s more tropical than a flamingo? It's very simple to follow and is written with the beginner in mind. All you need is some wool felt, some stuffing and an afternoon! - Felt scraps in various shades including two shades of pink for the flamingo, cream and black for the beak, two shades of green for the leaves, and three different shades for the flowers. I used white, yellow and pale pink. Polyester stuffing (hobbyfill or similar product) to stuff the pin cushion. Print out of the Pattern Template. You can download it here. Use your template print out as a guide for cutting out all of your felt pieces. 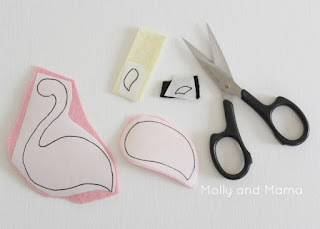 Use small sharp scissors to cut out your felt. They will give a nice crisp edge. Roughly cut out each shape on the paper template and pin it to the felt, then cut around it on the line. You could also trace the template pieces on freezer paper and iron each shape onto the different felt colours before cutting them out. This method is great for small and fiddly pieces that aren’t easy to pin. You can see how I’ve used this method in the image shown above the materials list. The blue base and flamingo are appliquéd onto the white felt rectangle. You may pin each piece in place before stitching down. Or you can choose to attach the felt to the white base using an iron on appliqué webbing like Easy Fix or Vliesofix. If you’d like to try this, but you’re not sure where to start, I recommend reading this tutorial. Be sure to use a press cloth to cover your felt before ironing it though! To attach the blue base, thread your embroidery needle with two strands of blue embroidery floss to match the blue felt. Place your blue felt piece over the base of the white felt rectangle. Pin or vliesofix in place. Secure the blue base using blanket stitch across the wavy top. For this section, my stitching had a narrow depth but was spaced wide apart. Leave the three straight sides stitch-free. They’ll be stitched when we put the pin cushion together. Next, secure your flamingo body to the white felt. Again, you may also choose to vliesofix this piece in place. Otherwise a couple of sewing pins will do. 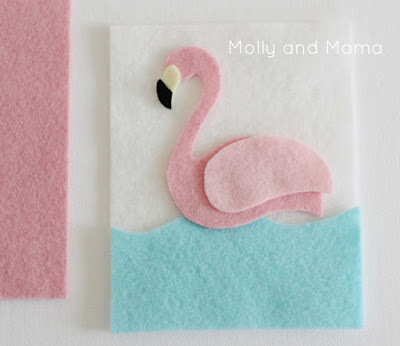 Ensure that the flamingo body slightly overlaps the blue felt and is centred over the white felt. Thread your embroidery needle with two strands of pink embroidery floss, and whip stitch the entire outline of the body to the white felt, using very small, straight and evenly spaced stitches. Using the photos as a guide, whip stitch the cream piece of beak in place using a single strand of cream embroidery floss. I find it easiest just to hold it in place as I stitch. Ensure the top of the beak slightly overlaps the base of the flamingo’s head. Hold the black beak tip over the beak, and whip stitch it in place with small, even stitches too. 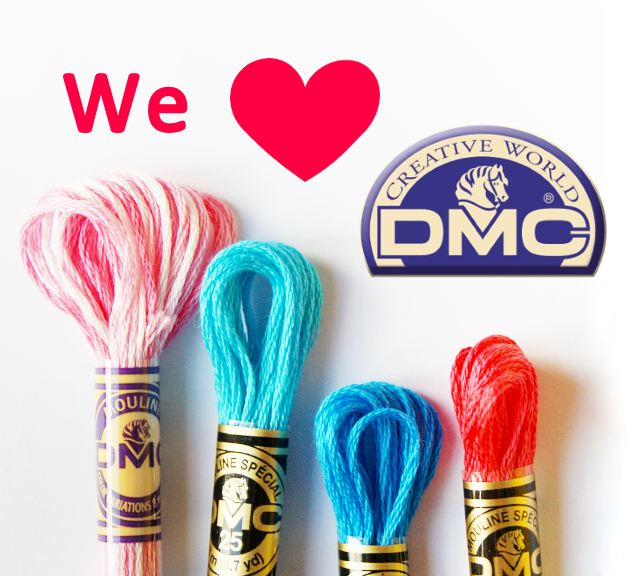 Use a single strand of black embroidery floss. While you have the black floss handy, rethread your needle with two strands of floss. 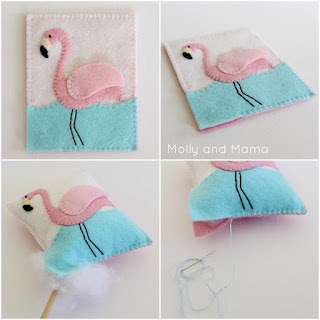 Stitch one French knot for the flamingo’s eye. 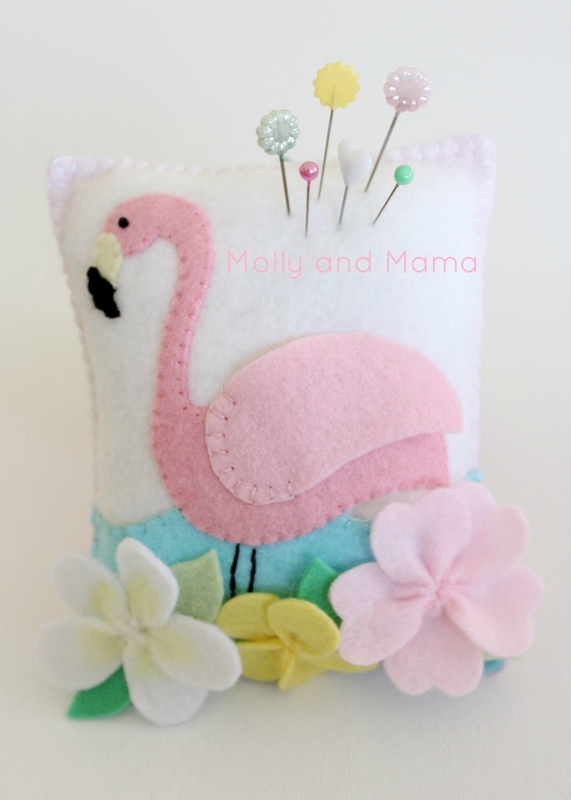 You can also back stitch two straight legs at the base of the flamingo, using two strands of black embroidery floss. Use the photos as a guide and free stitch them. Or if you’d prefer, mark some legs in with a water soluble marker. Keep in mind that the legs will end up being mostly hidden by the flowers and leaves. Add the Flamingo Wing Pin the wing in place so that it overlaps the top of the flamingo’s body. The tip of the wing should point down. With two strands of pink embroidery floss, blanket stitch just the front end of the wing, so that the back of the wing hangs loose. Use the right hand image above as a guide. Now that your flamingo appliqué is completely stitched, it’s time to put the pin cushion together. Lay your white felt rectangle over the pink back rectangle, and pin the pieces together. Thread your embroidery needle with 2 strands of white floss and blanket stitch around the whole top side of the pin cushion, where the white felt front is. Secure your stitching carefully at the beginning and at the end. Change your thread to blue (to complement your blue felt), and blanket stitch around one side and three quarters of the base. (The direction of my stitching in the image below) may be different to yours because I’m left handed). Leave an opening to add your fill or stuffing. Use a knitting needle or chop stick to gently manoeuvre small clumps of polyester hobby fill or stuffing into the pin cushion. Add your filling until the pin cushion is firmly (but not tightly) stuffed. Continue your blanket stitching to seal the hole, and complete the pin cushion. Now it’s time to embellish the pin cushion with some pretty flowers and leaves. 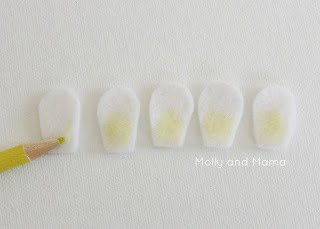 You can use the same method to stitch all three flowers. To colour the centre of the white frangipani petals, I used a yellow colouring pencil to tint the felt petals before I stitched them together. To sew each flower, lay out your five petal pieces. Use regular sewing thread doubled over on your embroidery needle, and knot the end. Starting at one end, sew running stitches across the base of each petal, being sure the thread enters and exits each petal on the top side of the felt. 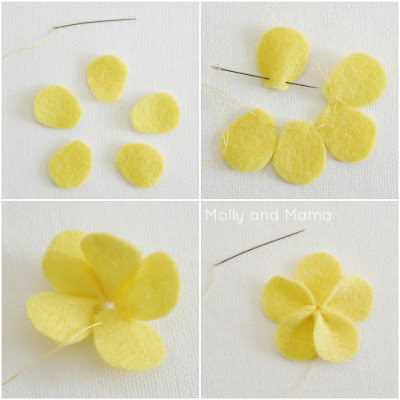 Gently pull the thread to gather the felt pieces together, and stitch them securely in place so the flower holds its shape. Arrange your flowers and leaves on the base of the pin cushion. Feel free to sew more flowers and leaves to add if you wish. When you’re happy with the arrangement, carefully stitch each piece in place with a doubled over strand of sewing cotton on an embroidery needle. You can use the image below as a guide. Now all that’s left to do is load up your pin cushion with pins! Thanks for reading along. I hope you’ve been inspired to give this ‘Summery’ sewing project a go. 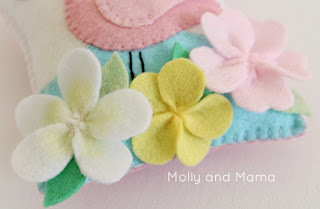 For more free tutorials, sewing ideas and inspiration, feel free to pop by the Molly and Mama blog. Feeling the urge to get creative but not sure where to start? Lauren from Molly and Mama has a passion for encouraging beginners on their creative journey. Her patterns and tutorials are perfect for all sewing levels. There’s pin cushions, softies, appliqué templates and more. Lots of fun to make, they’re also great to get the creative juices flowing! You can find Lauren online on the Molly and Mama blog, her store and Facebook page.